General: The basket ornament uses the same construction process of weaving as displayed in making lavender wands. There’s a wonderful picture tutorial of how to make lavender wands on the Labyrinth Hill website. This tutorial will assume you are familiar with that concept. 1. Tie one end of ribbon approximately 2 inches below base of lavender buds. 2. Turn the whole project upside down. 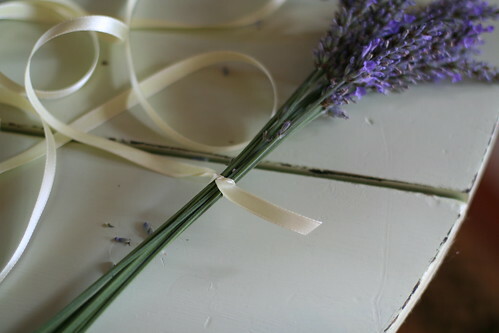 Spread stems in same fashion as you would for making a lavender wand. 3. Weave ribbon until you reach the base of the lavender buds. 4. Divide the stems in two parts. One part will have 6 stems, the other 7. These stems will be grouped to form the basket handles. 5. Cut 2 pieces of wire. Wrap wire around each of the two sections meeting to form a single handle at the top. The wire will keep the stems from separating and provide structure to the basket handles. 6. To finish basket, take remaining ribbon and wrap around the handle beginning at the base of the buds and making your way around the entire handle until you’re back where you started. Tie off the end and make a decorative bow as desired.